AG Barr has repeatedly won the Achievers ‘Best Overall Service’ award. Ian Johnstone talks about the supplier’s success and outlines his strategy for the wholesale industry this year. 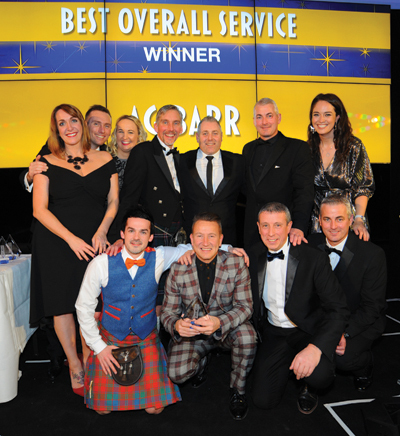 The team from AG Barr celebrate winning Best Overall Service to the Scottish wholesale industry. Left to right, bottom row: Keir Stewart, Ian Johnstone, Craig Barr, David Gibson. Top row: Sam Talbot, Billy Constable, Lorna Thomas, SWA chief executive Colin Smith, Steve McGarry, Lee Gibson, awards host Jennifer Reoch. To win the Scottish Wholesale Achievers award of Best Overall Service once is a huge achievement but to win it seven times in the past 10 years is truly remarkable. This is because it involves Scotland’s wholesalers firstly nominating their top suppliers and then voting each month over a four-month period for the service provided by the shortlisted companies. The suppliers are scored on deliveries (including admin support), wholesaler support and channel/customer support. To be given excellent scores month after month, year after year, means there must be a consistently high level of service. This year, AG Barr won with a score of 44.77 out of 50 – well ahead of any other supplier (Heineken was second with 41.33). “To win by such a big margin this year makes me think we are definitely doing something right and we have to make sure we continue to do that,” comments Ian Johnstone, AG Barr’s Scotland impulse sales controller. Johnstone attributes the company’s success to the right mix of customer relationships, relevance in terms of brands, and service. He explains: “At AG Barr, we have built up strong relationships over many years, and we shouldn’t underestimate the importance of those relationships. They are backed up with relevance – we have strong brands that are important to wholesalers, their customers and the consumer. Then we provide a really good service – our people are going through the wholesalers’ doors on a regular basis and we ensure that deliveries are on time and not short, for example. AG Barr has a team of five people serving Scotland’s wholesale industry full-time plus another person part-time. Johnstone has recently restructured this team, selecting regional business development manager Craig Barr to be a foodservice specialist. AG Barr is launching a new campaign for Irn-Bru in April. This follows reformulation of the drink last year and, although the details are currently under wraps, the initiative will emphasise that Irn-Bru is still the No.1 soft drinks brand in Scotland and show that the company is still putting a great deal of investment behind it.